It’s that time again – time to do a little globe-trotting for Travel Tuesday with Bonnie! Since I posted these distillery shots last Friday, I couldn’t resist following up with a full distillery tour today! We were in Scotland 10 full days (+2 for travel) and managed to make it to 7 distilleries. Not too bad, right? We didn’t tour all of them, but we did manage at least a tasting at each (smile). 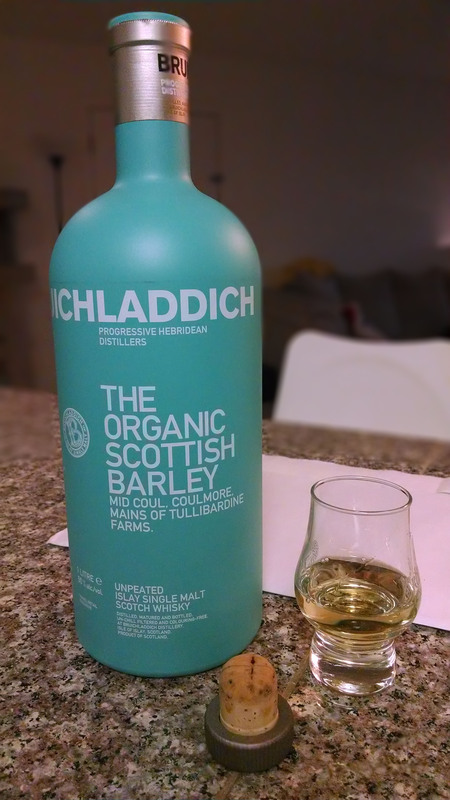 Scotch isn’t necessarily my go-to drink, but I can appreciate it under the right conditions. I actually learned a lot on these distillery tours and I feel like I now have a much deeper appreciation for the aqua vitae (water of life). Disclaimer: This is a technical tour according to my best recollection. We may have had a wee dram or two prior to and after the tour. My apologies if I’m not spot on. 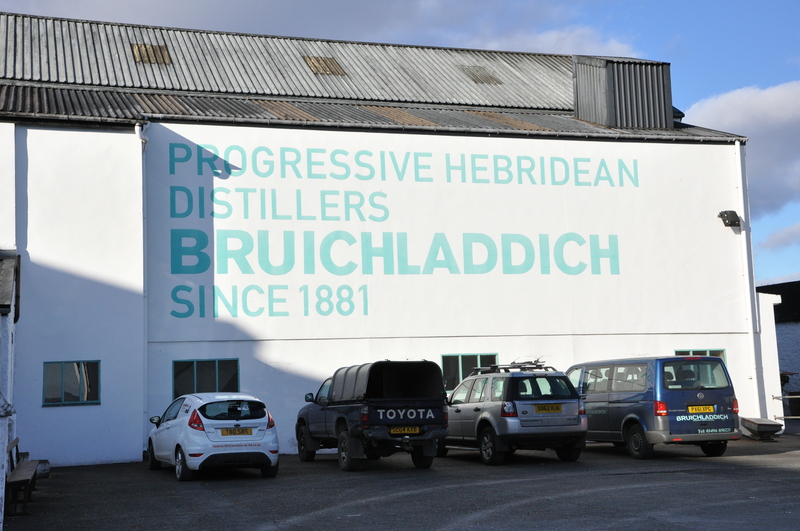 My favorite distillery we toured was Bruichladdich on the Isle of Islay. Wondering about pronunciation? It breaks down to something like this: Brook-la-dee on the aisle of eye-la. Yeah, it took a few corrections but I think I finally got it. I’m a little biased on this distillery for a few of reasons – 1) it was on a beautiful island; 2) the people were exceptionally friendly; 3) they allowed pictures throughout the tour (most do not); and 4) they make a really, really tasty dram (smile). Bruichladdich is a small distillery (by most standards), which opened up on the western side of the Isle of Islay in 1881. It’s one of the very few that takes it’s whisky from grain to bottle on site. There are no fancy computers and the only real modern machines I saw were in the bottling house. All of the barley used in the whisky is from Scotland – either the mainland or Islay itself. The first step in the process is called malting. The barley is steeped in water then allowed to germinate. Once the barley begins to sprout, it is stopped by drying the barley in a large oven or kiln – sometimes by burning peat, which gives the whisky a very distinctive smokey flavor. Bruichladdich produces unpeated, peated, and heavily peated whiskies, including one called Octomore which claims to be the most heavily peated Scotch in existence (having sampled it, I can believe it!). Once dried, the malt is ground in a mill and the resulting “grist” is mixed with hot water in a mash tun. Sugars from the malt dissolve and create a sugary liquid known as “wort” which can be turned into alcohol. This process is repeated a few times, with increasingly hotter water to get as much of the good stuff (technical term) out as possible. Washbacks – These were at least a story tall, I wish I could’ve gotten a better picture of size! The wort passes into huge barrel-like tubs called “washbacks” where it is fermented by adding yeast. The yeast converts the sugar into alcohol creating what is known as the “wash.” All of the washbacks at Bruichladdich are hand-made from Oregon Pine and can last anywhere from 40-100 years depending. It’s amazing how huge these things are – there were 6 here each with a capacity of approximately 210,000 litres! Each of these washbacks were at different stages in the process, but the smell was pretty amazing (smile). 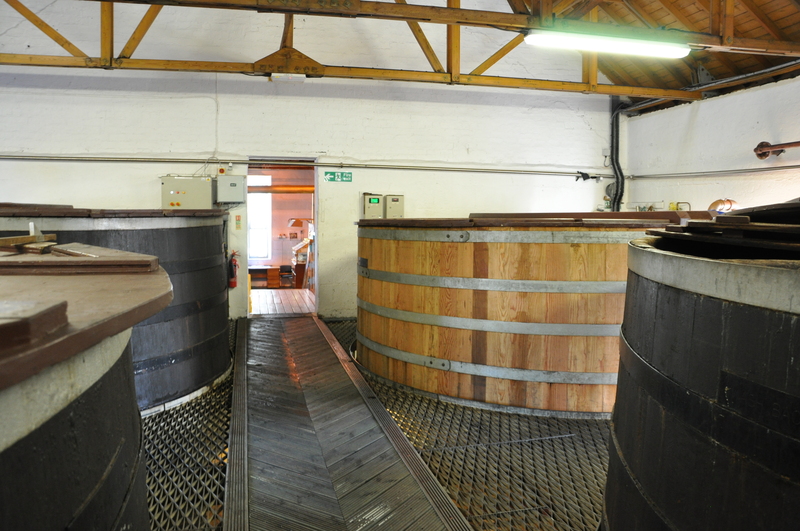 The wash is next distilled in copper pot stills – once in the wash still and once in the spirit still. As the liquid is heated, alcohol vapors rise and pass over the head of the wash still before being routed through condensors and returning to liquid. The resulting spirit, called the “low wines,” is sent on to the spirit still where distillation is repeated. From the spirit still, the whisky passes through the spirit safe. A few very knowledgeable fellows test the spirit for quality, taking only the “heart of the run” and returning the rest for the next run. 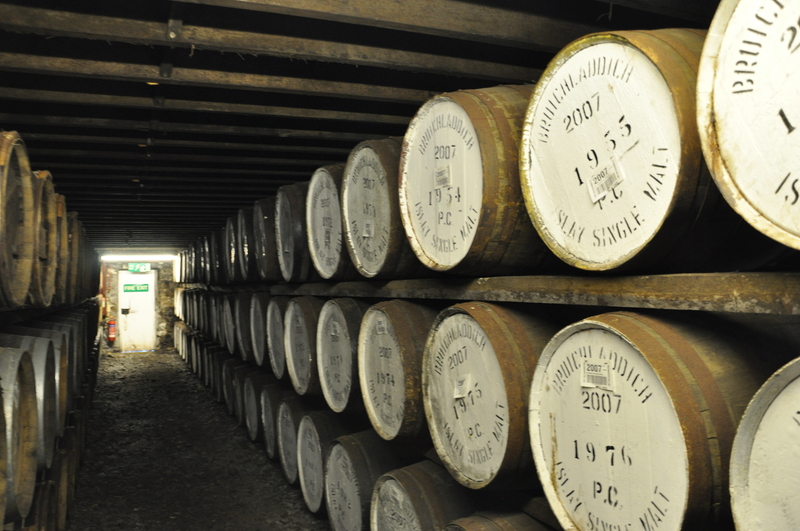 The new spirits go into oak casks to be aged into official Scotch whisky. 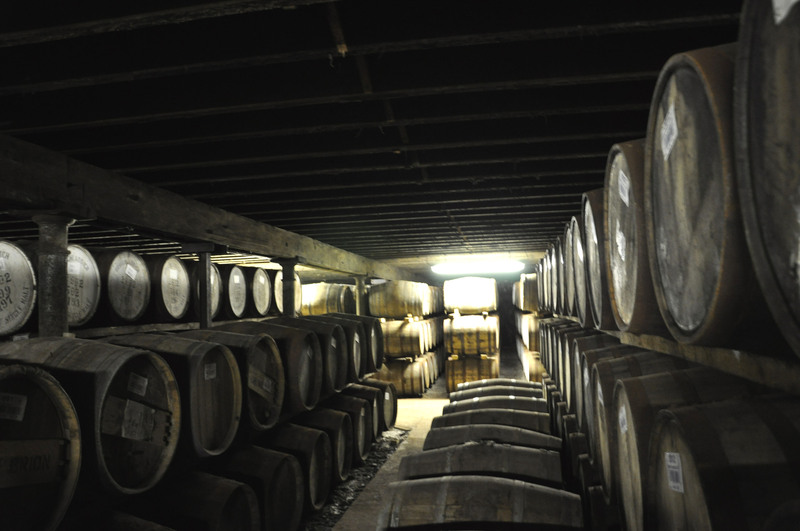 As the spirit matures in the cask, it develops further flavor characteristics and the distinctive golden color. The majority of these casks are bourbon barrels (in the US, the barrels can only be used once, so it’s a good deal for these guys) and can be used anywhere from 2-3 times depending on the spirit inside. Sherry casks are also used; there are several different “recipes” for aging times and cask types, which I’m not even going to try to get into. It definitely takes a specialist to get just the right flavors – talk about a job! One of the more random but cool things about Bruichladdich is that they also produce a gin called “The Botanist Gin.” I’m all for the occasional gin and tonic, but this is the first I’ve ever tasted where it’s good alone, all by it’s lonesome or with a wedge of lime. I was dumbfounded by how good this stuff is! The 9 classical gin aromatics are combined with 22 local botanicals, foraged on Islay, and distilled in a special pot-still affectionately called “Ugly Betty.” I, of course, brought a bottle home and have yet to find a bad combination – it goes well with citrus, berries, etc. It was definitely a great find (smile)! I also came home with a bottle unpeated Organic Scotch that is heavenly (smile). My brother, preferring more “manly” things, came home with a special bottle of Octomore. You guys, I cannot stress just how peaty that stuff is – I tried two sips of a dram and for the remainder of the day everything had a smoky flavor. It sort of tasted like drinking smoke from a doused campfire – weird but strangely comforting (I know, but that’s the best way I can describe it). I think I’ll stick to my nice, smooth unpeated Scotch (smile). I’m planning a separate overview of the other distilleries we made it to next week. Hope you guys enjoyed the tour (smile)! Are you a Scotch fan or do you prefer a different type of whisky? Or none of the above? Bruichladdich is DEFINITELY my favorite whisky, although I really must say that as I did an apprenticeship there a couple of years ago. Great folks, wonderful distillery and fabulous whisky. I loved every minute and drop of it! And your fantastic pictures make me just a teensy bit homesick. So glad you had a good time. Oh wow! I can’t imagine how much fun that would be! How long were you there? Islay seems like such a friendly community. It was truly the best time I’ve ever had working. And I wasn’t there nearly long enough. Couldn’t wait to get there. Didn’t want to leave. Beautiful shot! We stayed primarily on the west coast this trip, but I hope to explore more of the east next time around. I’ll be sure to put Glencadam on the list. I love when a place has both good spirits and a good story. Thanks for letting me know about it!